Time for anther fantastic Etsy Friday! 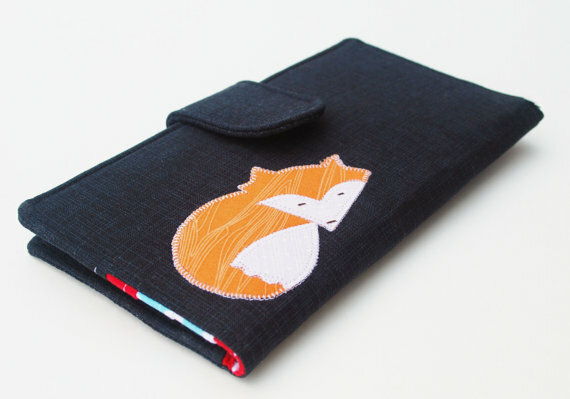 This week I have showcased three Etsy sellers with beautiful fox designed products. 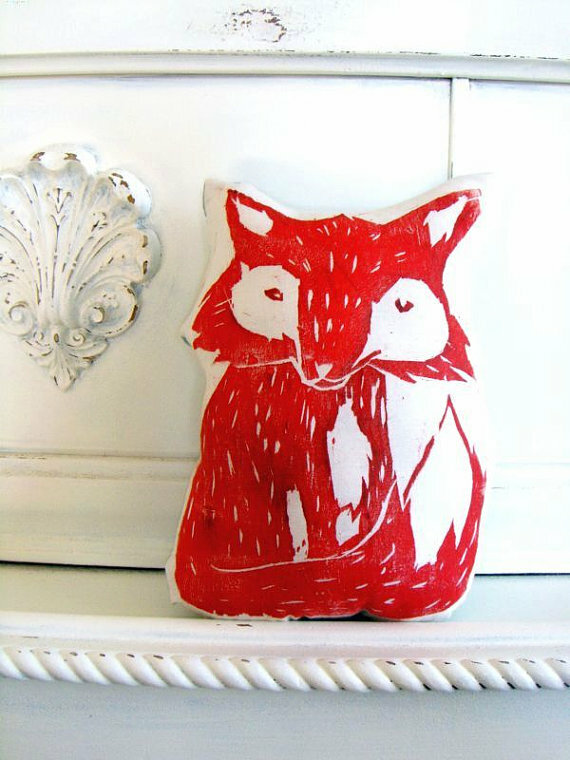 This little red fox pillow is just as sweet as can be! Perfect for a child, or honestly just wonderful for bringing some light-hearted whimsy into your home. Etsy seller Laura Frisk first draws her own original designs, and then hand carves them into a wood block. She then transfers the resulting images by inking the block with archival, eco-friendly water based fabric ink onto 100% cotton fabric. Once heat set the ink is waterproof and durable. Prints are freely cut then sewn into a pillow and stuffed with non-allergic polyfill. Finished size is approximately 8×10 inches. These cute pillows are custom made with your choice of ink color for the animal design, and fabric color on the pillow back. Need another animal from Laura’s menagerie? Just check out her collection which includes a bear, deer, rabbit, sheep, squirrel, raven, penguin, hedgehog, and many others! So adorable!! Keep this little appliqued orange fox close by your side in this clutch made with 100% cotton fabrics by Brooklyn Love Designs. Open to reveal a second sitting fox on the inside zipper pocket section, and a lining made with some brightly colored chevron fabric. Credit card pockets are a cute cotton aqua polka dot print. – Zipper pouch to hold change or other valuables. – Reinforced outside tab closure with slim easy to open magnetic snap. The 8″x4″ wallet is made to last with ultra-firm stabilizer adding durability and strength to the overall design. Etsy creator Meagan lives in the wilds of Alaska and clearly takes great pride in her delightful, woodland inspired designs. She also creates functional, beautiful coin purses, card cases and key chains. I have loved this quilt fabric art since the first time I saw it. I love the dark and light values of the colorful cottons that are seamed together to form this very stunning and visual piece. Titled “”Red Fox in the Sun”, this piece is an original work of art by creator CCollier Studio, and it comes mounted on stretcher bars. It is nicely sized at 19″ x 23″. 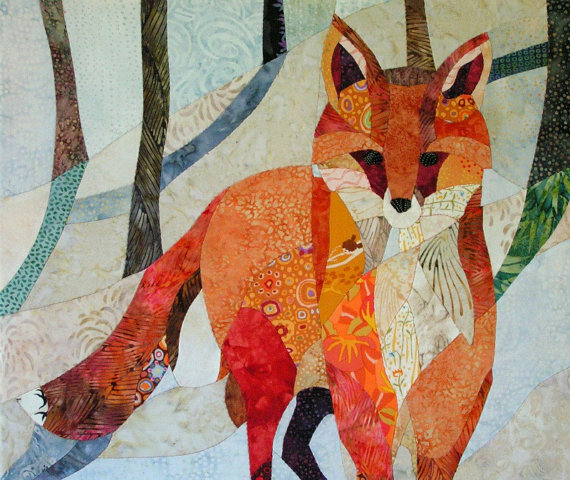 What is perhaps not immediately observable in the piece is that the only parts that are appliqued are the fox’s eyes and nose; all other cotton fabrics are pieced together to give more dimension to the artwork. I so love the subject matter and nice composition of this piece. It’s like the fox is “speaking” to you. The fabrics are mostly abstract batik and Kaffe Fassett prints. The deeper colors are brown tree trunks and blue shadows on the snowy hill behind the fox. In the fox fabrics you will find wildflowers and persimmons and…yes, even mermaids! Just take a closer look. This entry was posted in Etsy and tagged Brooklyn Love Designs, CCollier Studio, clutch, Custom Color, Fox, Fox Art, Laura Frisk, pillow, Quilt, quilt fabric art, wallet. Bookmark the permalink.